Here at Camuso CPA, we offer a wide array of tax services for investors including tax preparation and tax planning. Financial service companies are transitioning from employee driven revenue models to information driven revenue models. Camuso CPA strives to deliver useful insights and offer relevant explanations about the latest tax and financial topics. Most Cryptocurrency exchanges that you trade on will not provide 1099 reporting data. The exchanges that do provide this data like Coinbase or Gemini have historically only provided Form 1099-K which does not provide the relevant cost basis information required to accurately report your transactions for tax purpose and also does not reconcile multiple exchanges. That means you need to work with an experienced cryptocurrency CPA firm like Camuso CPA to protect your assets and legally minimize your taxes. We will reconcile all of your exchange data and accurately report your cost basis and gain/loss to the IRS. Since cryptocurrency is taxed as property almost every cryptocurrency transaction is a taxable event which means documentation is key in order to provide your CPA with all the relevant information required to accurate analyze your cryptocurrency transactions. While paying taxes can at times be painful, it is very important that you include your crypto-trading activity with your tax return. A lot of traders are convinced that because of the anonymous, decentralized nature of Blockchain and crypto transactions, that there is no way for the government to see or know that they are making money trading/buying/selling cryptocurrency. Unfortunately for these people, this is just not true. The Blockchain is a distributed public ledger, meaning anyone can view the ledger at anytime. Figuring out an individual’s activities on that ledger essentially comes down to associating a wallet address with a name. You can bet that the IRS is only gearing up to become proficient at doing that. Ultimately, if you choose not to file your gains/losses, you will be committing blatant tax fraud to which the IRS can enforce a number of penalties, including criminal prosecution, five years in prison, along with a fine of up to $250,000. Properly tracking and reporting your cost basis is imperative to protect your assets from penalties and interest as a result of underreporting. When analyzing cryptocurrency portfolios our starting point is the last ending tax year’s cost basis for each asset which is considered along with all relevant transactions from the current year to arrive at both an ending tax liability and ending cost basis for each respective asset you are holding. This means that if you did not track your cost basis correctly in prior years or did not report it that your portfolio calculation for years following that will also be incorrect. It is clear that, with the huge price declines in cryptocurrency markets during 2018, many people will be considering harvesting losses and reporting this for a tax benefit. If you did not report crypto activity up to now or tracked your cost basis improperly, those choosing to reveal losses this year will be at a high risk of audit and tax penalties. Taxpayers that have not previously reported will also need to report their crypto transactions every year going forward. Since crypto to crypto trades are taxable investors need to be very aware when making trades during the year and work with a CPA on an ongoing basis to track their portfolio’s tax labiality for estimated tax purposes. We really saw this hurt investors during 2017 and hurt their portfolio when they were liquidating it to pay taxes on profits during the bull run in a bear market. The good news is that since cryptocurrencies are generally classified as property, wash sale regulations should not currently be a concern for investors. This means investors can sell an investment to realize a tax loss, only to buy it back immediately thereafter at a bargain. Today, wash sales only apply to stocks and securities, so traders are operating in a gray area for now until further IRS clarification is issued. This is an area that we go over in detail with investors on an asset by asset basis to advise them on taking this position. We have saved investors millions of dollars in 2018 alone using tax planning strategies such as this. CPAs are late to the game but also rushing into the cryptocurrency space. As an industry leader in cryptotax services I have been able to observe how this niche sector is developing. It is not out of the ordinary for me to get targeted with ads from various franchise organizations to “double my accounting fees” by offering crypto tax services with no prior experience. This catches me off guard. I can only picture how investors are navigating this maze of service offerings and distinguishing from CPAs that have financial services experience and an understanding of crypto between CPAs that have just hopped on this bandwagon. Analyzing financial transactions are a detailed process that can easily be plagued with costly errors that can impact multiple tax filing years if you do not have a structured process and workflow in place. Analyzing crypto transactions adds another layer of complexity due to the nascency of this industry and the reporting standards from exchanges. Many CPAs are using a back offices from another company to actually analyze an investors’ portfolios and do not understand this process. Without the proper experience and training it is very easy for well-meaning accountants to make costly errors related to the portfolio calculations and advisory they provide investors. Be careful and do you due diligence. At the end of the day your tax return is your responsibility and it is your job to work with an experienced CPA firm to protect your assets. I would suggest that investors work with a CPA that not only understands and invests in crypto but also a CPA that has a strong background in financial services. 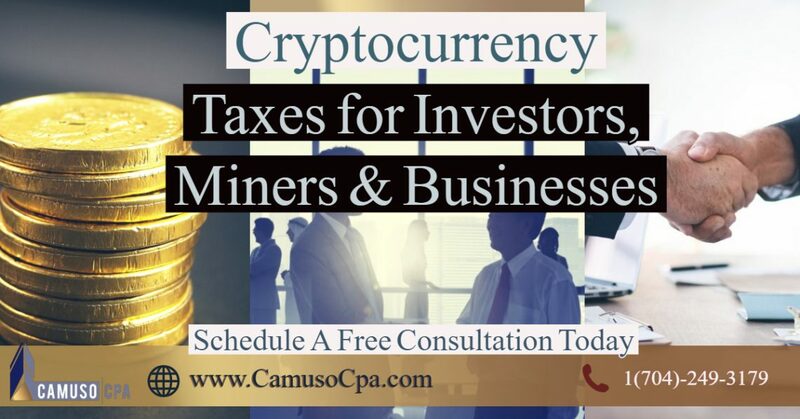 Here at Camuso CPA, we offer a wide array of tax and accounting services for cryptocurrency investors and traders including tax preparation, tax planning and portfolio reconciliations. Contact our team today to learn more about working with us and how we can protect your assets and legally minimize your taxes.